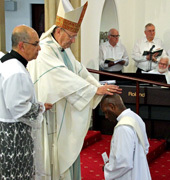 Parishioners, school children, fellow-Marists, other priests and visiting family members from Vanuatu witnessed the priestly ordination of Fr Willy Melteras SM at Holy Name of Mary church, Hunters Hill, NSW, Nov 29. 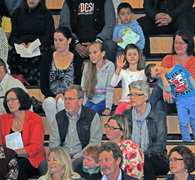 Hobart's Archbishop Julian Porteous presided at the ceremony in the packed church as others watched through CCTV. Fr Willy's brother, Fr Donald Melteras, was amongst the concelebrants. 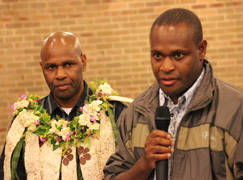 After initial formation in Fiji, 34 yr-old Fr Willy has spent the final months of his pastoral and mission experience in Hunters Hill-Woolwich parish and its schools. Congratulations, Fr Willy! 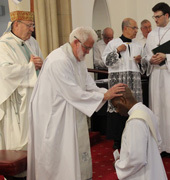 Above: Parish priest, Fr Kevin Bates SM, lays hands on the newly-ordained Fr Willy. 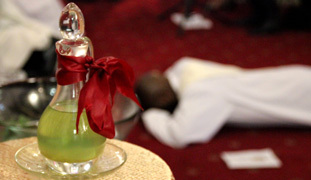 Fr Willy is clothed with priestly vestments / ... and anointed with the Oil of Chrism. The presentation of the gifts. 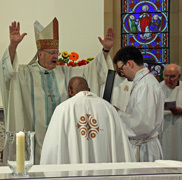 Below: Fr Willy takes his place as a priest at the altar with Archbishop Porteous. 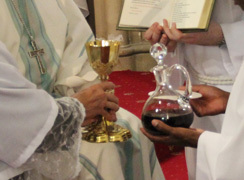 Communion time. Above: A final blessing for Fr Willy. 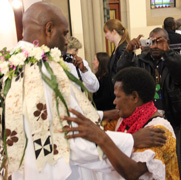 Clothing with traditional Pacific stole. 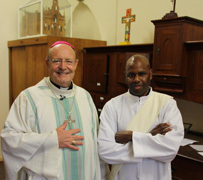 Fr Willy offer a priestly blessing to his mother / ... and to his priest-brother, Fr Donald. A blessing for fellow-Marist, Fr Jim Esler / ... and other family members. 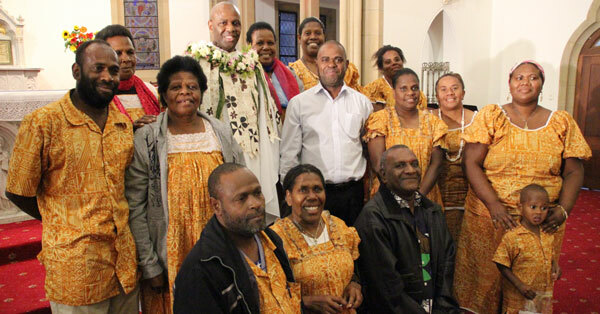 Below: Fr Willy Melteras with proud family members from Vanuatu. 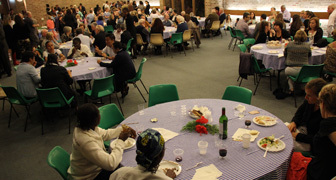 Above: Celebrations at Villa Maria parish hall. Fr Willy, 'king of the kids'. Below: Fr Willy cutting one of his two cakes / ... a grateful speech. 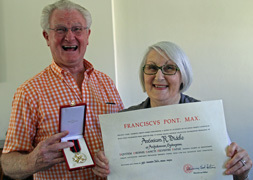 Fr Donald Melteras speaks on behalf of his family / a parish presentation to Fr Willy's mother. Fr Pio Fong SM, speaking on behalf of the Oceania Marist Province / parish priest, Fr Kevin Bates SM. 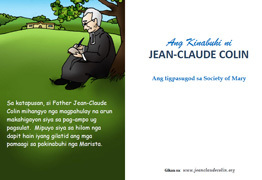 In rare moments of spare time during the Marist Asia-Pacific 'Spirituality & Lifestyle' program, Fiipino Marist, Fr Lauro Arcede SM, has created a Cebuano language version of the 'Life of Jean-Claude Colin for Children'. We offer a hearty 'Salamat' to Fr Lauro for this latest resource to help the world know the Marist Founder better. His booklet will soon be uploaded to the Colin web site. The illustrated 16-page booklet is currently in seven other languages: Burmese, English, French, Indonesian, Karen, Portuguese and Spanish, Click here. It will soon be available in a single-page leaflet format. Archbishop Julian Porteous with Marists, Frs Fred Kado and Tony Kennedy, and 2014's pastor, Fr John Girdauskas / Frs Fred and Tony hand over the parish banner to Archbishop Porteous. 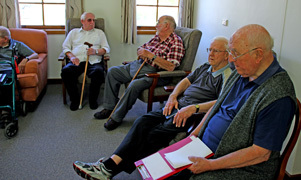 After fifty-seven years of service to the people of north-west Tasmania, the Marist Fathers are about to leave the parish of Burnie-Wynyard, handing it over to the Archdiocese of Hobart and a new parish priest, Fr John Girdauskas. 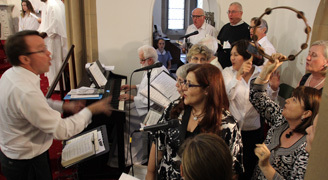 During a 'Goodbye & Hello' celebration weekend (Nov 22-24) present and former parishioners joined with Marists, local clergy and Hobart's Archbishop Julian Porteous to mark the event. 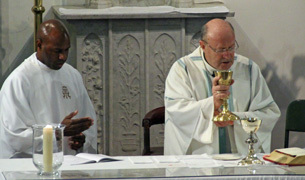 For parish priest, Fr Tony Kennedy SM's, report, click here. and for booklet on the history of Marists in the parish, click here. 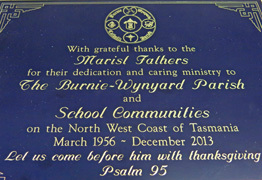 Above, from left: A plaque honouring the Marist presence in N-W Tasmanian parishes and schools. Frs Tony Kennedy and Garry Reynolds carry out items of appreciation presented by parish and school. 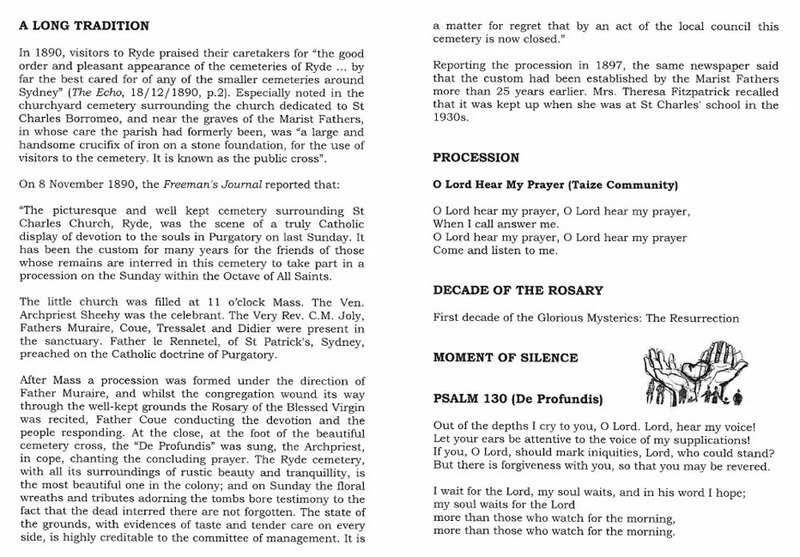 The booklet recording the Marist history in the parish. 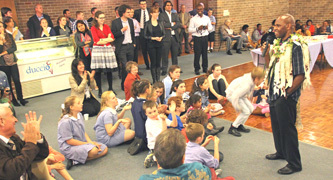 Below: Celebration Mass in the Harcombe Centre of Marist Regional College. 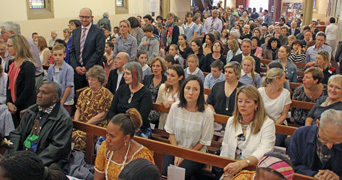 Above: Parishioners from the parish's several communities, joined local students and former parishioners and students in the celebration Eucharist. 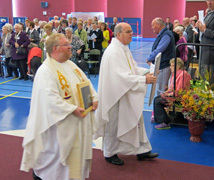 Parish priest, Fr Tony Kennedy SM / Fr John Girdauskas, returning soon to his home town of Burnie. Young and old were well represented. 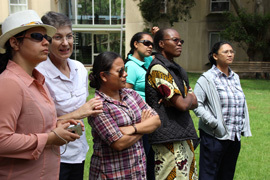 Fourteen junior-professed Marist Sisters from eight countries have assembled in Australia prior to their five-week formation program at Mulgoa, NSW, during Advent. 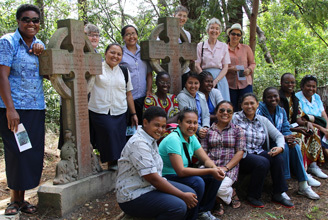 The Sisters come from Gambia, Senegal, Benin, PNG, Philippines, Fiji, Mexico and Brazil. They are pictured here on Nov 26 with Marist historian, author and vicar-provincial, Fr Peter McMurrich SM, on a guided tour of places of Marist interest accompanied by Srs Julie Brand, Kate McPhee and Judith Lythall. 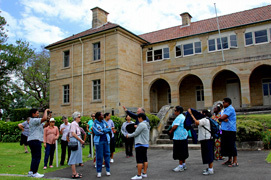 The young sisters explored Sydney's Rocks area with historic St Brigid's and St Patrick's churches before moving on to Hunters Hill and the Villa Maria precinct. A dozen 'BP-ers' were amongst the young Burmese refugees in Thailand this week either celebrating the success of graduation or hoping for acceptance into Australian Catholic University's next online Liberal Arts studies program. 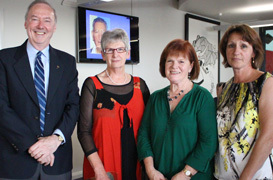 The Australian Marist-sponsored 'Bridge Progam' assisted six of the new graduates to gain entry to ACU's 2013 program. Another six 'BP-ers' have progressed to the interview stage in application procedures for 2014. 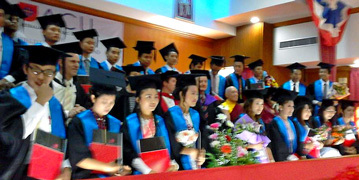 Above left: Six BP-ers are amongst the graduates at the ACU ceremony in Maesot, Thailand, on Nov 23. 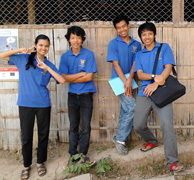 Above right: Some of the current BP-ers on the day of their final interviews with ACU, waiting hopefully for word on acceptance in 2014: Muriel Valles, James Brangnu, Seng San Aung and Seng Naw Mai / ...with two of last year's BPers, Saw Dingo and Naw Eh, who graduated on Nov 23. Below: BP-ers, James Brangnu, Seng Naw Mai and Muriel Vallies, with ACU's Professor Duncan MacLaren and Maya Cranitch / Applicant BP-ers, Eik Sai, Hein Thurain Tun (Naw) and George Myo Zaw Mya. BP-er George and daughter with a sign of hope / BP-er Eik Sai also hoping for interview success. After more than thirty years in the Marist Mission District of Peru-Venezuela, Fr Tony O'Connor SM will soon join the Marist mission at San Felipe de Jesús parish in Brownsville, Texas, as part of the U.S. province's ministry to the hispanic community in the border area. Fr Tony is pictured, left, at Villa Maria monastery, Hunters Hill, NSW, en route to his native New Zealand and visa procedures. Also pictured are Frs Hector Cruz SM and Joel Grissom SM with the staff of the Heavenly Father mission church. 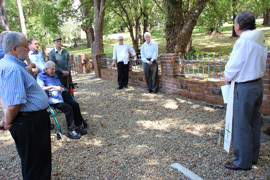 A small group of Marists gathered in the missionaries' cemetery of Villa Maria monastery, Hunters Hill, NSW, on Nov 21, for the interment of the ashes of Fr Stan Hosie SM who died in the U.S.A. on Jun 25. 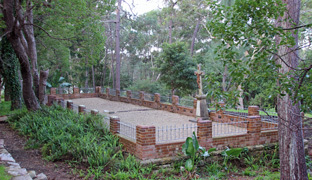 The simple ceremony was led by vicar-provincial, Fr Peter McMurrich SM, in the historic cemetery. Fr Stan's brother, author and historian, John Hosie, was also present as was Fr John Hill SM, contemporary of Fr Stan in his seminary years. They are pictured together, below. 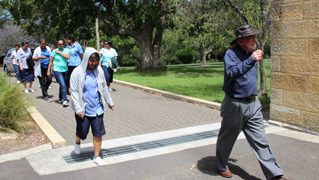 Members of the Maryvale/Montbel Marist community of Hunters Hill, NSW, were offered practical tips on falls prevention strategies during an information session on Nov 20. 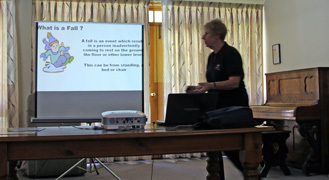 Master trainer, Sally Castell, from 'Movement Matters' presented health and fitness topics particularly relevant for the mature adult and those less active. 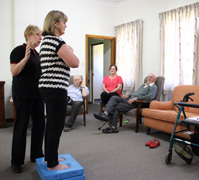 In early 2014 Sally will offer classes suited for those interested with moderate levels of mobility. 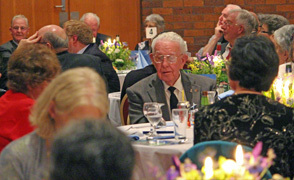 The Marist Fathers in Australia note with sadness the passing of Mr Bill O'Donnell, former provincial accountant for the Australian province and former Brother of the Society of Mary. 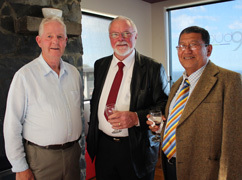 Bill died on Nov 08 and was farewelled in a private funeral in Hobart, Tasmania, on Nov 15. 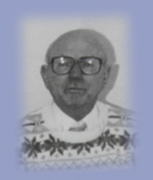 Pioneering the role of lay management of the province's finances and properties in the 1970s, 80s and 90s, Bill served with great dedication and astuteness. May he rest in peace. In a letter to al members of the Society of Mary, Superior-General, Fr John Hannan SM, has formally closed the Colin Year. 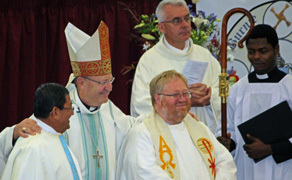 His announcement was made on Nov 15, anniversary of the death of Marist Founder, Ven Jean-Claude Colin, and a year after the Colin Year commenced in 2012. Throughout this time a lamp has been kept alight by the official icon of Fr Colin in the General House in Rome. 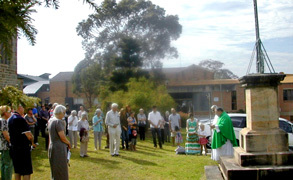 On Nov 14 Marist Asia-Pacific 'Spirituality & Lifetsyle' participants joined with members of the Villa Maria monastery community at Hunters Hill, NSW, to celebrate the end of the Colin Year. 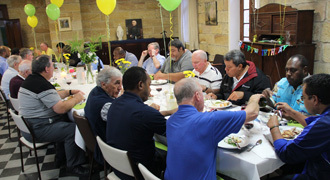 Community superior, Fr Peter McMurrich, led a short prayer service intervened between courses in an evening dinner which also celebrated the 'November birthdays' of confreres. 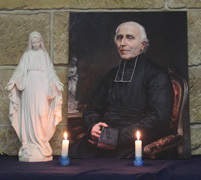 The ceremony included the lighting of candles before a statue of Our Lady and a reproduction of the Tollet painting of Fr Founder along with S&L members' singing Fr Ben McKenna's 'Colin Song' with musical setting by Fr 'Aisake Vaisima. 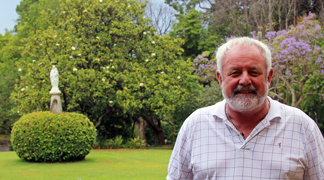 Business Manager for the Australian Marist Fathers province, Tony Biddle, has been chosen to be a Knight of the Order of St Sylvester by Pope Francis for services to the Sydney Archdiocese and the operations of the Society of Mary in Australia and abroad. Tony was one of five recipients of the award at a ceremony at St Mary's cathedral, Sydney, on Nov 13 and was guest of honour at a celebratory morning tea at 'Maryvale', Hunters Hill, on Nov 14. 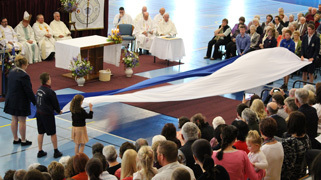 His nomination citation noted that Tony was 'living out the ideals of the Beatitudes in quite a remarkable way through his generous and whole-hearted support to the Marist ideal and to the overall Catholic way.' Congratulations, Sir Tony! 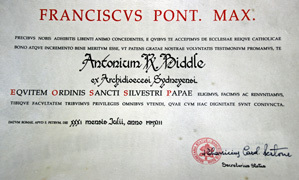 Above: The certificate of membership as Knight of the Equestrian Order of Pope St Sylvester. Tony Biddle and his wife, Jan, with the badges of office / Tony with his son, Andrew, who will succeed his father in early 2014 as provincial business manager. 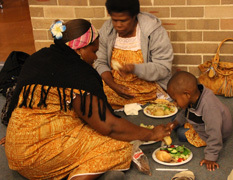 Below: The morning tea at 'Maryvale' with Marists, family and friends. Vicar-provincial, Fr Peter McMurrich SM, speaking to the Papal Knight on behalf of the gathering. 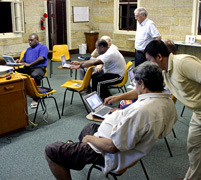 Participants in this year's Marist Asia-Pacific 'Spirituality & Lifestyle' program have weekly sessions on information technology. 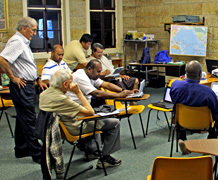 The Monday evening course includes an introduction to computers and the Internet as well as skill development in a variety of programs including PowerPoint, Publisher and Photoshop. Historic Villa Monastery is equipped with Wifi and laptops for the use of the S&L men. Each participant is encouraged to have an active email account and a working familiarity with some or other social media program, eg 'Skype'. Internet security and lifestyle issues are also part of the agenda. 'This happens on the Sunday in the Octave of the Feasts of all Saints and All Souls. It was started in Ryde by Marists in the late 1860's. 'When Fr John Worthington and I were driving around the Marist Places in France looking for La Neylière and St Chamond it struck me the number of these crosses dotted all over the French countryside.' The tradition lives on at St Charles. Far left: Fr Bob Barber presides at St Charles' annual public cross ceremony. 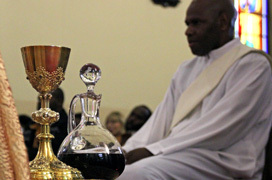 Left: S&L participant, Fr Elie Bebesus SM at the cross. Significant anniversaries include the fall of the Berlin wall (1989) and the Dili massacre (1991). 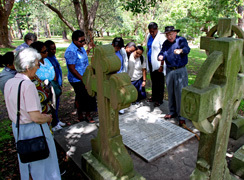 On Nov 04 Marists from Asia-Pacific countries gathered in the historic missionaries' cemetery in the grounds of Villa Maria monastery, Hunters Hill, NSW, for the annual Holy Souls remembrance. 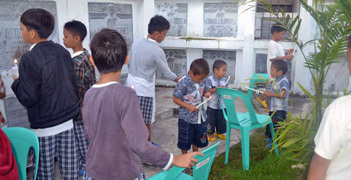 Australian Marist missionary, Fr Philip Callaghan SM, was amongst those remembered in a ceremony at the Davao Catholic cemetery, Mindanao, Philippines, by the 'Balay Pasilungan' street kids group. 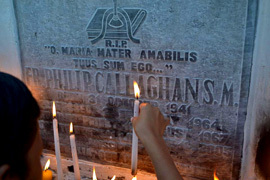 Fr Philip died in 2005 after almost 40 years of ministry in Oceania and the Philippines. 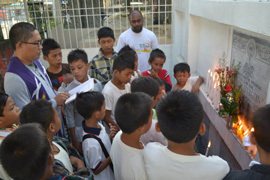 From Davao Fr Lionel Mechavez SM reports: 'We remember and pray today the souls of Fr Phil (deputy director 1995), Br Richard (2005), Antonio Diaz (Board of Trustee) and members of our own families who have gone ahead of us. 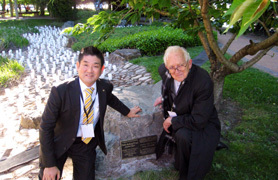 A plaque honouring Marist missionary, Fr Tony Glynn SM, was unveiled in Canberra Nara Peace Park recently during the Candle Festival by Mayor of Nara, Mr Gen Nakagawa and brother of Fr Tony, Fr Paul Glynn SM. 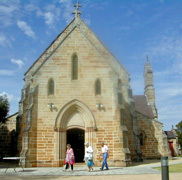 Fr Tony was instrumental in the reconciliation of Australia and Japan after WWII and in establishing the sister city relationship between Canberra and Nara. Mr Nakagawa and a delegation of Nara Citizens have been visiting Canberra to celebrate the 20th anniversary of the sister city relationship. 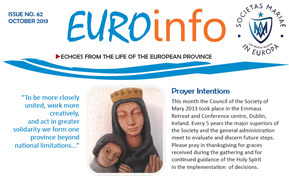 Reports from the Marist Fathers in Europe include the Council of the Society meeting in Dublin, renovations of La Neylière, seminanrian Daniel Fernandez's mission experience in Thailand and the Marist Family branches meeting in Italy. 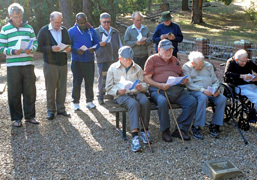 Daily visits to www.maristfathers.org.au during October peaked at 603 (Oct 01) and averaged 446 daily. Visitors opened an average of 9 pages per visit and were responsible for over 375,000 'hits; during the month, a maximum for the year to date. 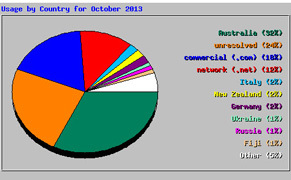 Visits came from 89 countries and approx half were from commercial or network sources.